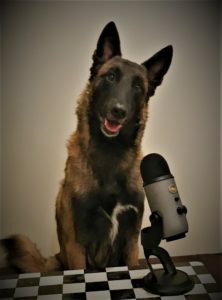 Below are available podcasts and upcoming webinars on dog training stuff! – July 12, 2018 – Achieving Nosework Trial Day Success. – April 26, 2018 – Foundations in Five! – December 1st, 2017 – Chatting with Melissa Breau about Handler Scent Discrimination and AKC Scentwork! Drac’s here to answer any questions!